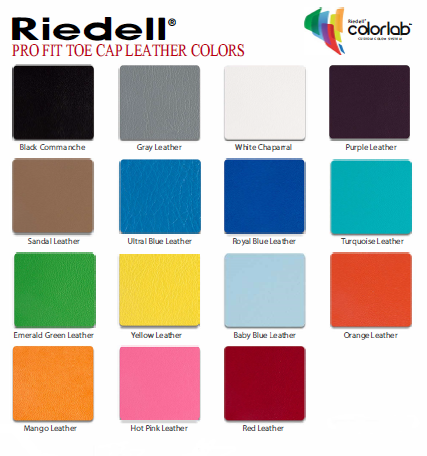 Riedell Pro Fit Toe Caps are the perfect combination of toe and lace protection to keep your skates looking like new. The Pro Fit Toe Cap attaches at the toe stop, extends around the toe of the boot and finishes about half-way up the laces. Laces are fed through the top of the Pro Fit Toe Cap to create a secure and ultra-protective fit. Crafted from top-quality, hand sorted leather. The Pro Fit Toe Caps come in one standard size that fits all Riedell boots, including the new Solaris, and are available in several color options. upgraded to these with the purchase of my new skates, they do their job and last longer then duct tape, so yeah, not much to say about these, just make sure you lace them in high on your skates and don't pinch them with the nut for your toe stop.